Buenas noches, I said, my heart pounding as I caught my first glimpse of the ski masks, bandanas, and automatic weapons. 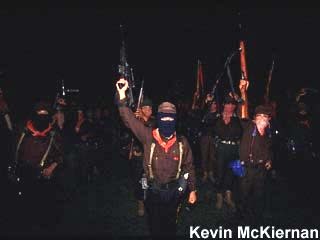 It looked like a unit of 40 or so guerrillas, maybe a night patrol in the mountains. I strained to look more closely. I saw a Chinese AK-47 and a Belgian FAL, several old carbines and shotguns. So these were the armed farmers. One of the smallest rebels, apparently a leader, stepped forward. His handshake was limp. Where are your credentials? he asked me. I produced a press card and told him who I was. He was cradling a short-barreled M-16, the automatic weapon some U.S. officers preferred in Vietnam because of its light weight. It looked new, and for some reason I found myself giving him a few extra points for that. "Why did you come here? ", another rebel asked curtly. He was holding a heavy rifle, maybe an Israeli Galil or a German-made G-3. I didn't want to look too hard. Two reasons, I said, trying to clear my throat. First, I wanted to find out why the people of Chiapas were unhappy. (That should stop them, I hoped. Besides, it was true.) Secondly, I have been looking for you guys. I want to photograph you for the American news. The two men who had spoken backed away. The flashlight went off. They started talking indian. Then the first man stepped forward, again in front of me. Without the light, it was hard to make out the eye slits in his mask. "Is that your answer?" he asked incredulously, "you wanted to find out why the people of Chiapas are unhappy?" Yes, that was my answer. Anyway, I was stuck with it.